You just opened your first fast food restaurant! But the bad news is there's just no one coming in! Get your foot in the door by showing off exactly what you can do! The orders keep coming in, but if you're a great line chef, then you go into absolute focus mode. Everything else falls away as you create burger after burger in this race against the clock! Go shopping for all of the freshest ingredients and love the chocolatey cake you've created! It's quick, easy, and cake-tastic! The depths of the ocean is a banquet of delicious fish, shellfish, and other underwater delicacies. Create an amazing salad dish with fish, veggies, and seafood broth. It's not fast food. It's good food quickly. And isn't that a better combo? Speaking of combo, get the burger, drink, and fries, it's the best deal for the price! 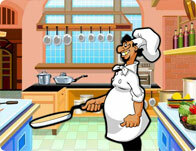 Use your mouse to click on and through the floating decorations for the food in this fun food game. Prepare, cook and serve a delicious seasoned chicken recipe in this fun baking game. Follow the in game instructions to chop tomatoes, onions, garlic and add seasoning. Noodles are yummy no matter who you are, and with the master noodle maker you can really cook up something special! Today we're making grilled fish with lemon! We're going to serve it on a bed of sausage, rice, and peppers, and finish it off with a heavy spray of fresh lemon! Help get back all the cakes by using you flatulence powers! Don't worry about these salad sticks! It's not all about lettuce and celery. Create a tasty fruity appetizer for any barbecue with oranges, strawberries, and mango slices! Toss the egg as high as you can go, moving from one safety net to the next! Help cute Kitty here and make sure the Yellow Cat restaurant will have the best customer services and the tastiest ice creams in town! Make some really delicious spooky cupcakes in this cute cooking game. Collect your ingredients, mix them well and bake! Test your salad making skills and chop, slice, and arrange your vegetables for an amazingly flavorful and zesty salad.